Back home in Cape Cod, he wrote, a stranger would look away if he tried to make eye contact. In the South, a stranger would be likely to say “hello”. Strangers, black and white, were quick to offer help and advice, even without his asking for it. He greatly driving back roads in the South. He enjoyed Southern cooking and the music in Pentecostal churches. He made more trips than he originally planned. But he was shocked by the dire poverty in regions such as the Mississippi Delta, which reminded him of what he saw traveling in Africa. The difference was that, in Africa, he frequently came across American missionaries, philanthropists and foreign aid workers trying to alleviate poverty. Poor Southern communities, in his view, are own their own, so far as American corporate executives, politicians and philanthropists are concerned. I read Theroux’s travel book, Deep South: Four Seasons on Back Roads (2015) as a followup to the writings of David Hackett Fischer and Colin Woodard on the origins of American regional cultures. 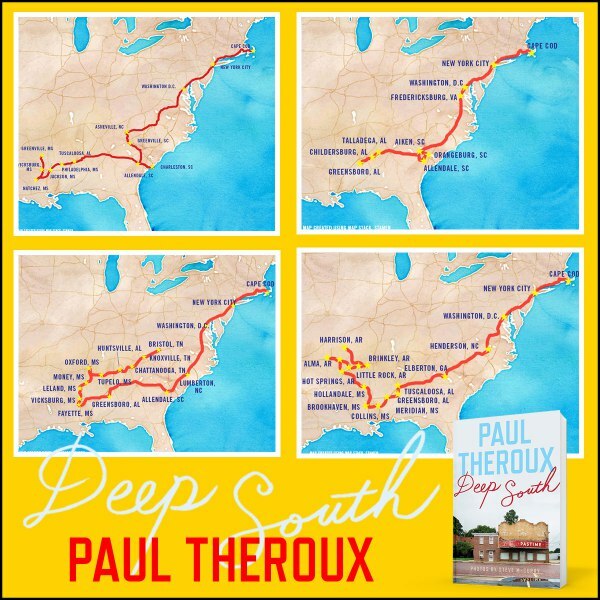 Theroux skipped big cities such as Atlanta, which he said are little different from Northern cities, nor what he called the Old Magnolia South, the South of horse farms, historic preservation and gracious living. He did not interview prominent politicians or anybody whose name I’d heard before. Instead he concentrated on the small towns and back roads, and talked to people he met in diners, churches and gun shows. The bulk of the book consists of reports of conversations, with roughly equal numbers of whites and blacks. In most cases, he did not specify the race of the person he was talking to, and I somethings had to read quite a few paragraphs before I could deduce the race from context—which, significantly, I always could do. Many Southern white people think Northerners see them caricatures, based on how they’re depicted on television and in the movies. One man told Theroux he gave up watching television because he is tired of programs that only show a smart black man and a stupid white man. Theroux thinks a certain type of Southern regional writer is partly responsible for this stereotype. Writers such as Erskine Caldwell, Truman Capote, Flannery O’Connor, Carson McCullers and others depicted poor Southern white people as freaks—albinos, hunchbacks, 12-year-old brides, colorful con men and generates. Not that their tall tales have no merit as stand-alone works of literature, but their approach was a way of not dealing with segregation, chain gangs, sharecroppers and lynchings, Theroux wrote. Only a few white Southerners wrote about everyday life in the rural South in the kind of way that Anton Chekhov wrote about the frustrations of life in rural Russia. Ex-Senator James Webb wrote a book, Born Fighting, (which I haven’t read) about the Scots-Irish settlers of the Appalachia plateau. If it hadn’t been taken, it would have made a good title for C.D. 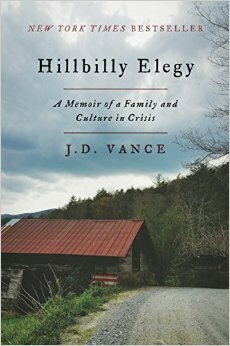 Vance’s Hillbilly Elegy: a Memoir of a Family and Culture in Trouble. Appalachian mountaineers were the product of a culture of honor which also was a culture of violence. They believed in standing by their word and by family friends and family; they believed in never showing fear, never backing down and always avenging in any insult or injury. These values enabled them to survive in the lawless Kentucky wilderness frontier. 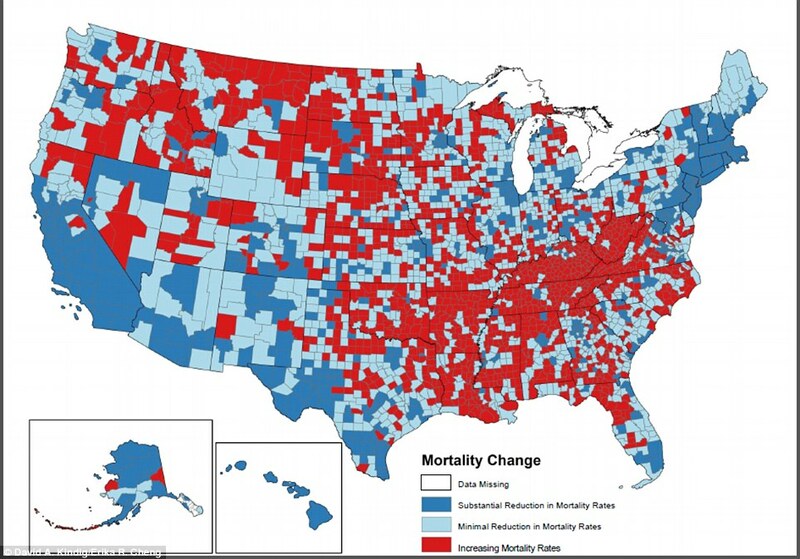 Vance in his book argues that this same heritage is inadequate to help them survive in a declining industrial America. The book is worth reading because his experiences and family history show how patterns of behavior that can trap people in poverty and misery, and also ways of breaking out of of those patterns. He grew up in Middletown, Ohio, but his family roots are in Jackson, Kentucky—in “bloody Breathitt” county, known for its feuds. His maternal grandparents, Jim Vance, then aged 16, and Bonnie Blanton, then 13 and pregnant, fled Kentucky for Ohio in 1950, and eventually settled down in Middletown. At the age of 12, his grandmother shot a cattle thief and would have finished him off if somebody hadn’t stopped her. Once she told C.D.’s grandfather that if he ever came home drunk again, she’d kill him. He did come home drunk once again, and, a woman of her word, she doused him with gasoline and set him on fire. Remarkably he escaped with only minor injuries and this did not destroy their relationship. She once warned C.D. that if he continued to hang out with a classmate who smoked marijuana, she would run over the classmate with her car. He found that a credible threat. His grandmother and her husband, who never went anywhere without loaded guns in their pockets or under their car seats, flouted conventions of middle-class behavior. But they were honest, hard-working and self-reliant; they were able to look out for themselves and their loved ones. Never speak in a reasonable volume when screaming will do. If the fight gets a little too intense, it’s okay to slap and punch, so long as the man doesn’t hit first. Always express your feelings in a way that’s insulting and hurtful to your partner. If all else fails, take the kids and the dog to a motel, and don’t tell your spouse where to find you. His childhood left him with permanent scars. He said he still has to struggle to escape the conditioning to immediately retaliate for any affront, no matter what the consequences. He reminds me of the black writer, Ta-Nehisi Coates, and his accounts of growing up in violent inner-city Baltimore. Ronald Reagan’s attacks on the minimum wage, families being helped by welfare, those receiving unemployment insurance when the economy failed, became racialized attacks, and not viewed as attacks on the foundation of worker survival. 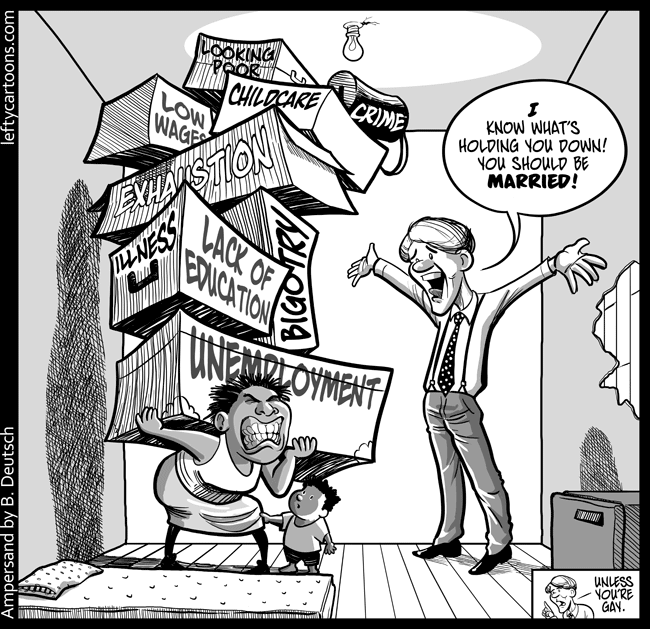 So in the 1980s, the real value of minimum wage drifted to unprecedented lows, states rolled back eligibility to, and benefit levels for, unemployment insurance and the foundation was laid to attack women who needed help in raising their children to force them into low-wage work. Without providing any gains to American workers, Reagan mastered the appearance of worker advancement by succeeding not by having wages rise with productivity, as had been the case, but by having wages rise relative to the poor who could not find jobs, or could only find minimum wage jobs. The silence of the labor movement in the sinking fortunes of the poor meant there was political space, for the first time since the 1930s, to have the economy improve and expand while the poverty rate increased. 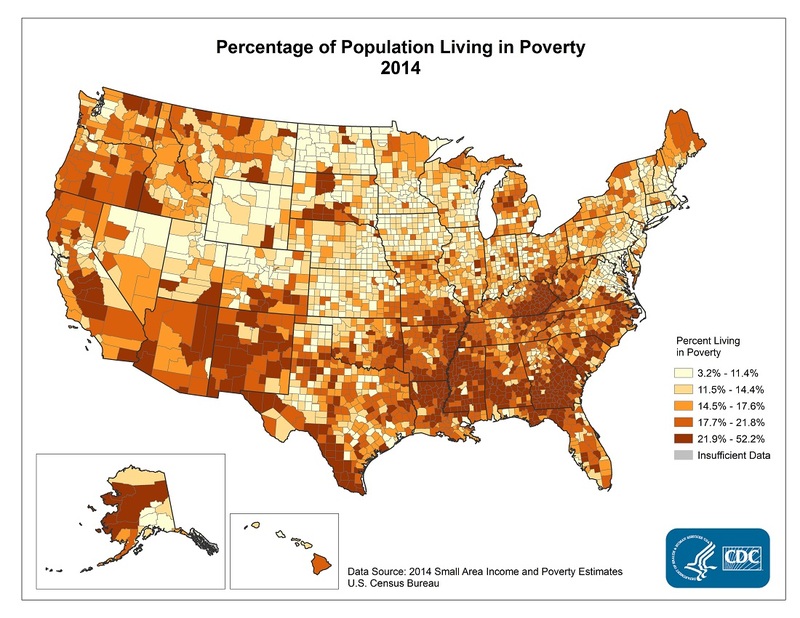 Large numbers of Americans—especially those of us born into poor, black families—experience poverty at some point in our lives. It is also true that large numbers—especially those of us born into affluent, white families—experience wealth at some point in our lives. If somebody starts out in life poor and winds up making a middle-class income or at least a living wage, that is not a bad thing. It’s different if somebody starts out in life poor, attains a middle-class income or living wage and then is laid off at age 55 and never again gets a full-time job, no matter how hard they try. I know people in both categories. Similarly if people rise or fall in income due to their work ethic and competence, or lack of it, that is not a bad thing. If they are economically insecure due to trends in the economic or corporate policies beyond their control, that is another thing. Among the people I know, the latter is much more common than the former. A survey by the National Low Income Housing Coalition shows that if you work full-time for minimum wage, 40 hours a week and 52 weeks a year, and set aside 30 percent of your income for housing, you can’t afford to rent a moderately priced standard one-room apartment in any state in the USA. And that goes for states with minimum wages higher than the federal minimum wage. That doesn’t mean that minimum wage workers have to be homeless. But they do have to work more than 40 hours a week, or devote more than 30 percent of their incomes to apartment rent, or settle for cheap substandard quarters, or all three. 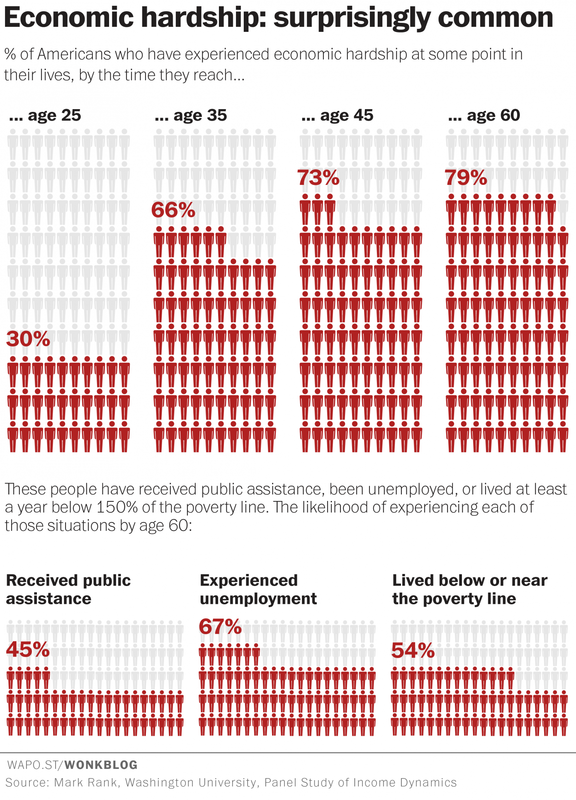 Most Americans are struggling these days, but some of us are struggling harder than others. Out of Reach 2015: Low Wages and High Rents Lock Renters Out by the National Low Income Housing Coalition. 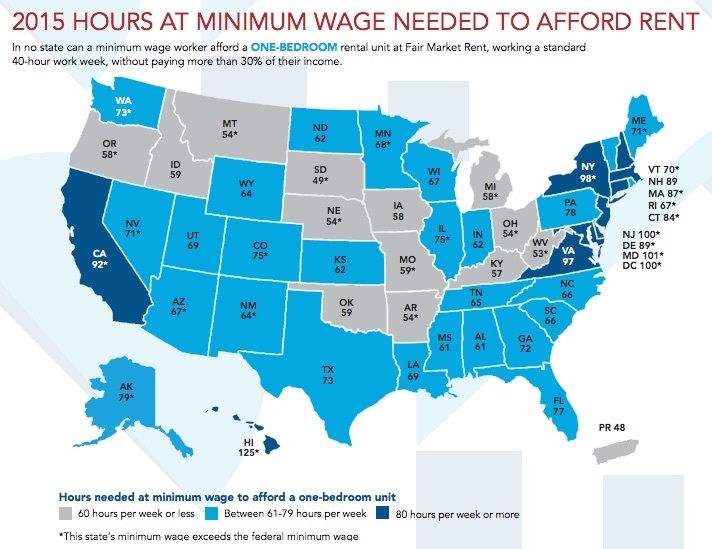 In No State Can A Minimum Wage Worker Afford a One-Bedroom Apartment by Tyler Durden for Zero Hedge. In These 21 Countries, a 40-Hour Work Week Still Keeps Families in Poverty by Flavia Krause-Jackson for Bloomberg News. More than half of students attending public schools in 2013 were low-income, the first time they were in the majority since these figures were tracked. That is, they are not necessarily poor (according to the federal definition), but they are eligible for free or reduced-price school lunches. Students can get free lunches if their parents’ incomes are 135 percent of the federal poverty threshold or less, and reduced price lunches if their parents’ incomes are 185 percent or less. A child of a single parent could get a free lunch if the parent’s income was $19,669 or less. The child could get a reduced-price lunch if the single parent’s income was $27,991 or less. The reduced-price limit is $43,568 for a family of four. 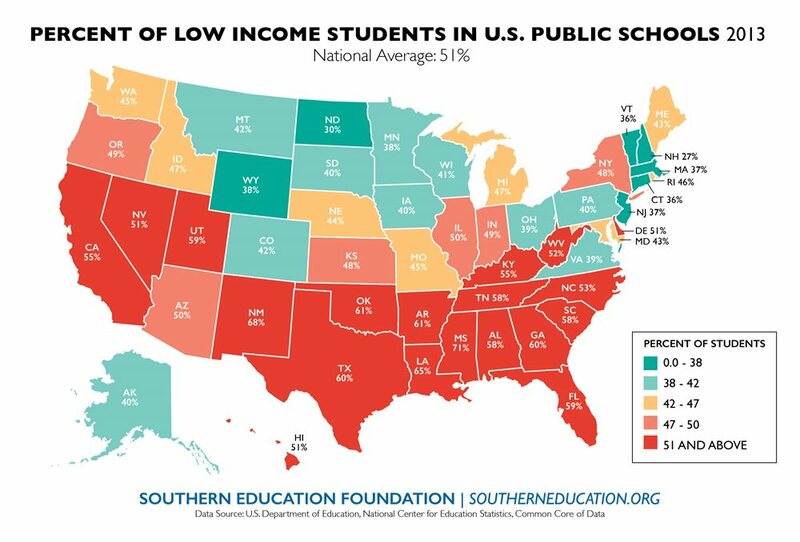 Low-income students were fewer than 32 percent of students in U.S. public schools in 1989 and only 38 percent in 2000, the Southern Education Foundation reported. Reed Jordan of the Urban Institute said the 51 percent figure reflects rising child poverty, increasing economic instability and possibly increasing number of poor immigrants. About one in four American public school students are the children of immigrants. Changes in eligibility rules also could affect the number. Schools in which a majority of students are low-income now offer reduced-price lunches to all. 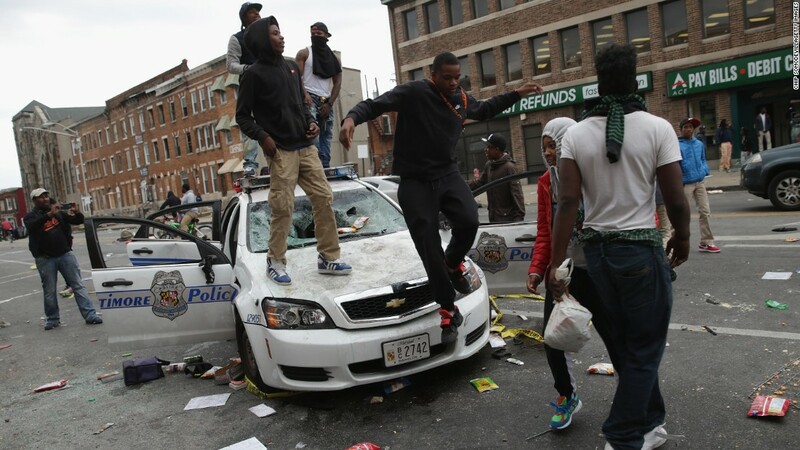 Conservatives such as David Brooks claim that the real problem of poor black people in cities such as Baltimore is not poverty, unemployment or police abuse, but bad moral character. 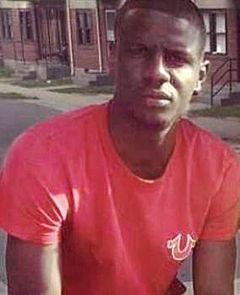 It is too bad that Freddie Gray died in custody of Baltimore police, but he would have been a loser no matter what, Brooks argued in a recent New York Times column. Now it is true that there are Americans who are so completely demoralized that they couldn’t thrive even in a high-wage, full-employment economy. I don’t know how many such people there are. The way to find out is to create a high-wage, full-employment economy and see what happens. My concern is with the obstacles faced by poor people who are doing everything humanly possible to get out of poverty. I’m thinking of people who work full-time at minimum wage, some at multiple jobs, and still are in poverty. 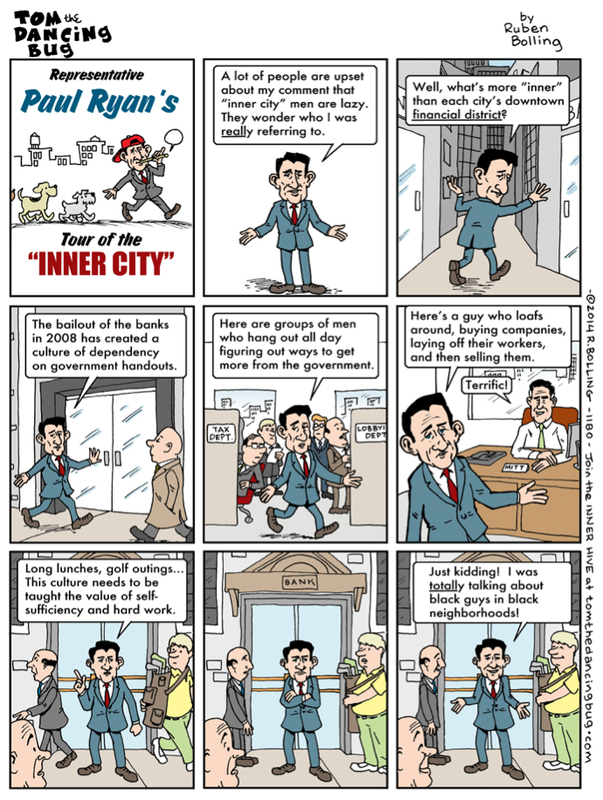 I’m thinking of working people who don’t get paid sick days, can’t afford child care and have no transportation to work. Not all are black and not all are in big cities, although black people in poor city neighborhoods are targets of abuse by virtue of living where they do. President Obama was asked about the Baltimore riots in a press conference yesterday. Here’s part of what he said. If you have impoverished communities that have been stripped away of opportunity, where children are born into abject poverty; they’ve got parents — often because of substance-abuse problems or incarceration or lack of education themselves — can’t do right by their kids; if it’s more likely that those kids end up in jail or dead, than they go to college. In communities where there are no fathers who can provide guidance to young men; communities where there’s no investment, and manufacturing has been stripped away; and drugs have flooded the community, and the drug industry ends up being the primary employer for a whole lot of folks — in those environments, if we think that we’re just going to send the police to do the dirty work of containing the problems that arise there without as a nation and as a society saying what can we do to change those communities, to help lift up those communities and give those kids opportunity, then we’re not going to solve this problem. And we’ll go through the same cycles of periodic conflicts between the police and communities and the occasional riots in the streets, and everybody will feign concern until it goes away, and then we go about our business as usual. If we are serious about solving this problem, then we’re going to not only have to help the police, we’re going to have to think about what can we do — the rest of us — to make sure that we’re providing early education to these kids; to make sure that we’re reforming our criminal justice system so it’s not just a pipeline from schools to prisons; so that we’re not rendering men in these communities unemployable because of a felony record for a nonviolent drug offense; that we’re making investments so that they can get the training they need to find jobs. That’s hard. Could you feed an American family of three, plus a dog, on $30 a week? I couldn’t. Joseph Cannon could, and did, but it took effort and ingenuity. He told how on a post on his web log. 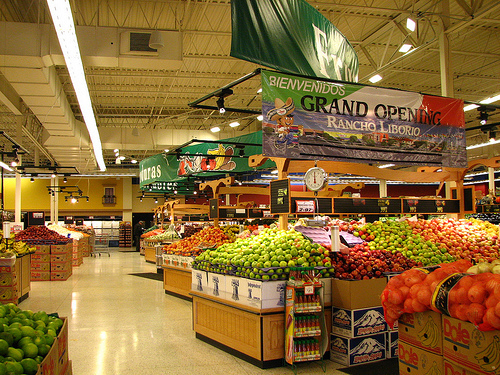 One tip: Hispanic groceries (in California). Another: Food in bins, not in bags. A third: Whole chickens on sale. But read the whole thing. The SNAP Challenge: Here’s the Real Way by Joseph Cannon for Cannonfire. Republicans in Congress want to repeal high-stakes testing provisions in the No Child Left Behind program. I think this is a good thing overall, not a bad thing. Proposed by the George W. Bush administration and enacted with bipartisan support, the NCLB program measured teacher and school performance by means of achievement tests. The idea supposedly was to highlight how schools are failing poor and minority students, but the only remedy is punishment of teachers and schools for low test scores. The result was to scapegoat teachers, schools and, by implication, public education itself. 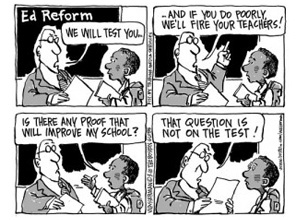 All this was called school “reform,” although to reform something means to correct its defects and make it better, which is exactly the point at issue. I think we the people should watch the details of what is being proposed—specifically in regard to provisions regarding charter schools and privatization of public schools. But in general I think the push-back against NCLB reflects the experience and justified opposition of parents and teachers. My e-mail pen pal Bill Harvey, who sent me a link to a Politico article reporting the Republican plan to overhaul NCLB, also sent me a link to a Truthout review of Educating for Insurgency: The Roles of Young People in Schools of Poverty by Jay Gillen, a Baltimore public school teacher and mentor for the Baltimore Algebra Project, which began as an after-school mathematics tutoring program, but evolved into something much more powerful. 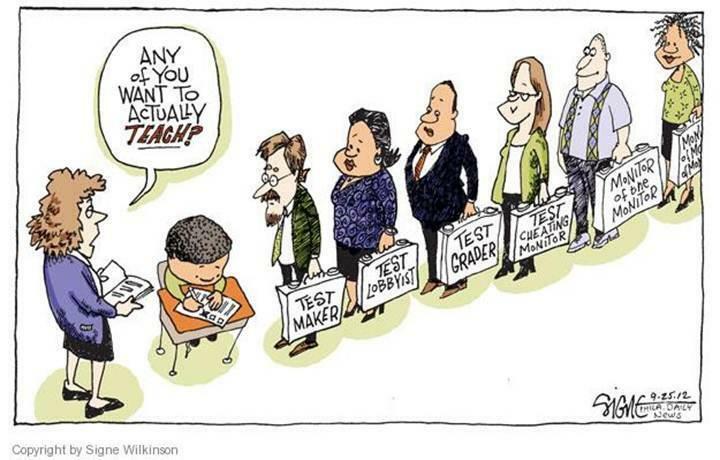 If somebody in authority wanted to improve education, especially for poor and minority students, they would talk to people such as Gillen and the other teachers who’ve risked their careers to resist meaningless tests. 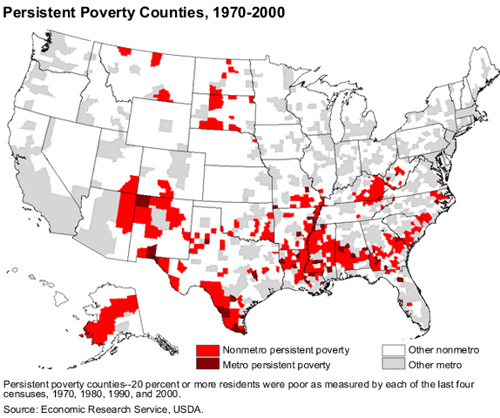 White poverty exists, ignored by Leonard Pitts Jr. for the Miami Herald. There are more poor, unemployed white people in the USA than there are poor, unemployed black people, and poor whites, too, are targets of prejudice. I remember being told as a boy that “white trash” were a lower class than “Negroes”. But the basic cause of poverty is the same in the slums of Detroit or small towns in Kentucky: Employers shutting down and moving out. Aggressive police take hundreds of millions of dollars from motorists not charged with crimes by Michael Samish, Robert O’Harrow Jr. or Steve Rich for the Washington Post. Since 9/11, police have seized more than $2.5 billion from 61,998 motorists without search warrants or indictments. At what point to the police stop being protectors and start being predators? Tom Cotton and the era of post-truth politics by Steve Benen for MSNBC. The GOP candidate for Senate for Arkansas tells blatant lies and gets away with it. The postmodernist philosophy is that there is no such thing as objective truth, only different ways of looking at things. This philosophy seems to have taken hold in American politics. Andrew Cuomo Is a Very Flawed Concept by Charles P. Pierce for Esquire. Given a choice between a right-wing Democratic candidate and an extreme right-wing Republican candidate, This is why I plan to vote for the Green Party candidate for governor of New York. What If Banks, Not Abortion Clinics, Needed Buffer Zones? by Barbara O’Brien for Open Salon. 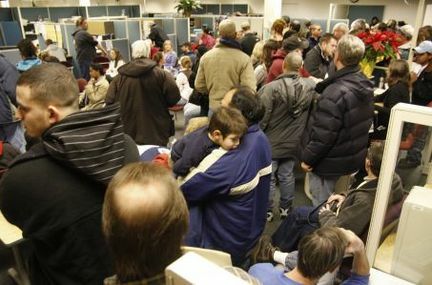 What if people doing business with the “too big to fail” banks had to run a gantlet of yelling protestors just to enter the bank. Suppose the banks were vandalized, and their employees subject to harassing and threatening telephone calls. Suppose bankers had actually been murdered. Is there any doubt that the bank protestors would be classified as terrorists? Yet all these things have happened with abortion clinics, and it is accepted as normal. The Unkindest Cut by Elias Vlanton for The Washington Monthly. Joshua Steckel, a high school guidance counselor, worked hard with students from poor families to convince them it was both possible and worthwhile to qualify for college by studying hard. But at the end of the road, his students found that college was unaffordable. Financial aid packages only covered part of the cost of college, and what was left was more than poor families can pay. Antibiotic scientist must push discovery to market by Kelly Crowe for CBC News. The emergence of antibiotic-resistant bacteria is a big threat to public health. Yet few if any drug companies are interested in developing new antibiotics. Profits on new antibiotics are small and risky because developing new antibiotics is difficult and expensive, regulatory approvals take time and money and antibiotics soon become obsolete as bacteria develop new resistance. Peru now has a ‘license to kill’ environmental protestors by David Hill for The Guardian. Under a new law, Peruvian police can escape criminal responsibility for killing civilians while on duty without having to show they are acting according to police regulations. Big business loves desperate, overqualified, underpaid workers by David Atkins for The Washington Monthly. Today’s South is boldly moving backwards by labor historian Nelson Lichtenstein for Reuters. Historically Southern business leaders have sought to compete with the North by means of cheap labor. This is still true. Obama Admin’s TPP Trade Officials Received Hefty Bonuses From Big Banks by Lee Fang for Republic Report. I’m old enough to remember when a personal computer or even a television set were so expensive than an average person couldn’t afford it. But nowadays second-hand television sets and electronic gadgets are so cheap that hardly anybody does without them. The things that are increasingly out of reach are child care, health care and education — the things you need to rise in the world. The things that are affordable are the games, toys and entertainment that distract you from your condition and reconcile you to the limited life that you have. 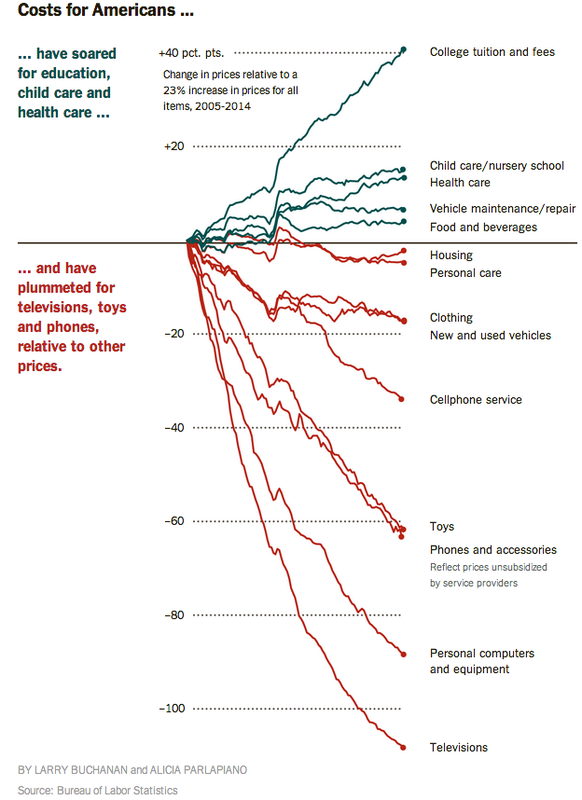 Click on Why America’s Essentials Are Getting More Expensive While Its Toys Are Getting Cheaper for more by Derek Thompson for The Atlantic. One of the big arguments against raising the minimum wage is based on an over-simple understanding of the law of supply and demand — that if employers have to pay higher wages, they’ll hire fewer workers. If that were true, then the long-term decline in the minimum wage and in median workers’ wages (adjusted for inflation, which you should always do) would have resulted in full employment. Obviously this hasn’t happened. A rational employer will hire as many workers as necessary for the profitable operation of the business, and no more. The law of supply and demand sets limits. The employer will not pay so much that he can’t operate profitably, nor so little that nobody will work for him. But, as is shown by the difference between Costco and Walmart, there is a broad range between those two limits. Suppose I have a franchise to operate a McDonald’s restaurant. I would not raise wages to the point where higher costs forced me to charge more for a hamburger than the Burger King restaurant across the street. But if the minimum wage was raised for both of us, we could pay higher wages and still be on a level playing field. In theory, minimum wage could be raised to the point where I charged more for hamburger than people were willing to pay. But there is no evidence that this has ever happened with minimum wage in the United States. One economist, for example, compared employment in adjoining counties of adjoining states with different state minimum wages. There was no evidence of any difference in unemployment rates or job availability. A higher minimum wage could have a positive effect on employment. If low-wage workers have more money to spend, there is a greater demand for goods and services, and could result in new hiring. Hat tip for this to Mike the Mad Biologist.